Researchers designed the new 3-D printed robot entirely from soft materials. It is powered by chemical reactions controlled by microfluidics. 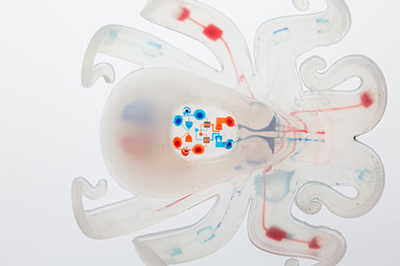 Researchers at Harvard University's Wyss Institute have unveiled their latest innovative robotic design: a 3-D printed robot nicknamed "octobot." The nickname octobot was inspired by the octopus, which served as a source of inspiration for the group given the mollusc's ability to perform great feats of strength and flexibility, despite lacking an internal skeletal system. Michael Wehner, postdoctoral fellow at the Wyss Institute and co-first author on the work, says that the biggest challenge has always been replacing traditional hardware with soft components. "The main challenge in building a completely soft robot was the need to eliminate so many traditional components," he said. "This endeavor required us to rethink the way robots are designed from the bottom up. The soft robotics field has long desired to use hydrogen peroxide as a fuel, and pneumatic actuators are relatively common in soft robotics. Embarking on this project allowed us to embrace monopropellant fuel, pneumatic actuation, microfluidics, and combine them all using the novel embedded 3-D printing technology." This means the octobot is essentially powered by gas under pressure. The technology was designed so that a reaction inside the robot can transform a small amount of hydrogen peroxide into a large amount of gas, which then flows into the octobot's arms to inflate them. Wehner says that 3-D printing was a crucial component of the design process, as it allowed them to successfully integrate soft components. "While 3-D printing is a very broad area, the techniques of embedded 3-D printing were critical in developing the techniques to build octobot," Wehner says. "The disparate areas of liquid monopropellant energy conversion, microfluidics, kinematics and dynamics, actuation, and robotics could not have been successfully integrated without using this novel 3-D printing technique. As researchers around the world expand 3-D printing capabilities, such as the embedded 3-D printing we used, the design possibilities will expand as well." Don't miss the MD&M Minneapolis conference and expo, September 21-22, 2016. Qmed readers get 20% off with promo code Qmed16. Robotics have long been hailed as one of the most promising areas of technology in the medical device industry, but lately their role has become a bit less clear. The elevated costs associated with their implementation, as well as the training and compatibility issues that come with robotic technologies have stymied their impact. However, Wehner sees soft robotic technologies carving out their own niche, separate from traditional robotics in the realm of medical technologies. "Of course traditional robots are extremely useful in a wide variety of tasks, however, there are several areas in which traditional robots are not well suited," he said. "In fields where a gentle touch is more important than a rigid grasp, we believe soft robots will emerge as the winner. Soft robotic grippers are already being used to handle undersea structures in scientific research. One can easily envision soft robots being used to handle fragile objects such as crops, or even living beings. Internal medicine and wearable devices are also likely areas for future soft robots." For now, Wehner and his colleagues at Harvard hope to continue their research in an attempt to develop more soft robotic technologies with enhanced capabilities that can better understand and respond to the environment around them. Above all else, the hope is that this breakthrough can be the beginning of a new generation of robotic technologies. "We certainly hope that our work will serve as an inspiration for other researchers," Wehner said. "It has certainly inspired us to think about additional possibilities, and we could not have completed our work without relying on publications of previous work, so we hope to inspire others as well. We are excited to move this research forward. We could definitely foresee building future soft robots with more sophisticated actuation and control, including more complex gait cycles and robots that sense and respond to their environment."